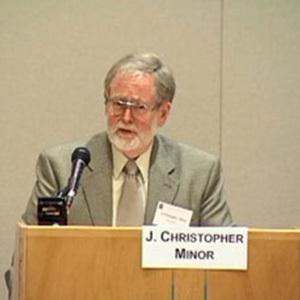 John Christopher (Chris) Minor is the senior shareholder of the law firm of Minor, Bandonis and Haggerty, PC. He graduated from Willamette University College of Law in 1967 and was admitted to practice before the Oregon State Bar in that year. His undergraduate major was in physics. Court admissions include the courts of Oregon and the U.S. District Court in Oregon, the Ninth Circuit Court of Appeals, the U.S. Tax Court and the U.S. Supreme Court. Chris Minor’s practice emphasizes real estate law, business and business organizations, contracts, estate planning and municipal law. In 1986 he served as Chairman of the Oregon State Bar Section of Real Property and Land Use Law, and has served on various OSB committees over the years, including the Real Property Law Committee, the Committee on Uniform State Laws (chairman), the Realtor-Lawyer (Joint) Committee (chairman), the Lincoln-Linn-Benton County Professional Responsibility Committee and the Unauthorized Practice of Law Committee. He is a past president of the Lincoln County Bar Association, past chair of the OSB Real Estate and Land Use Section and a past president of the Oregon City Attorneys Association. He has served as a continuing legal education speaker on real property topics for the Oregon State Bar Professional Liability Fund, the Real Estate and Land Use Section of the Bar, the Oregon City Attorneys Association. the Professional Land Surveyors of Oregon and the Oregon Paralegal Association. Chris’s experience includes trials and appeals of real estate disputes, but for the most part he now leaves litigation to other members of the firm. He enjoys working with real estate issues, including commercial leases, property and business purchases and sales, development, condominiums, easements, foreclosures, boundary disputes and many other real estate matters. Over the years, Chris has represented many different governmental entities, businesses, banks and individuals. He has been active in community affairs, serving as President of the Lincoln County Chapter of the American Red Cross, President of the Newport Rotary Club and as a member of the executive board of the Oregon Trail Council of the Boy Scouts of America. He is married to Mary Minor. They have four children and six grandchildren. Once an avid skier, deteriorating knees have led Chris to substitute motorcycle touring for the ski slopes.